Whatever their rank, all military personnel get the same amount of annual paid time off. Military members get 30 days of paid leave per year, earned at the rate of 2.5 days per month. Military leave is a bit different than traditional leave at civilian organizations, partly because it counts weekend days against the balance. And according to military regulations, leave must start and end in the same local area. For example, if you begin your leave on Monday, you cannot leave the local area until Monday, even if you are off-duty on Saturday and Sunday. Conversely, if you schedule your leave to end on a Friday, you must return to the local area on that Friday, even if you're not scheduled for work until the following Monday. Regular leave is approved or denied by the military member's immediate supervisor. Emergency leave, which is applicable when a military member's family member dies or is seriously ill, is approved by the commander or first sergeant. Emergency leave days still count against the 30-day leave total. If circumstances warrant, a military member could "borrow" leave he or she hasn't earned yet from his or her future allowance. With a few exceptions, commanders are usually reluctant to approve leave that hasn't been earned yet. It is because, under the law, a person who is discharged (for any reason) and who has a negative leave balance must repay the military one day's base pay for each day "in the hole" as of the date of the discharge. Leave is based on the government's fiscal year, which begins Oct. 1 and ends Sept. 30. If the fiscal year ends and a military member has a surplus of leave time, she or he can carry over a maximum of 60 days to the next fiscal year. Exceptions to the 60-day limit may be allowed if there are unusual circumstances. But under most situations, if a military member has 65 days of leave as of Sept. 30, he or she loses those five extra days as of Oct. 1. In most cases, the cost of travel is at the member's expense while on leave. However, in the cases of emergency leave, while assigned or deployed overseas, or deployed at sea (such as in the Navy or the Marine Corps), the military will arrange free transportation back to the United States. Once members arrive at the port of entry, the cost of travel to their leave area becomes their responsibility. And when the leave is finished, the military will arrange for free transportation from the port back to the overseas or sea duty assignment. 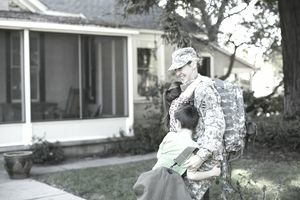 Surplus leave can be "sold back" at the time of reenlistment and separation or retirement. Each day of leave saved can be sold back for one day's base pay. A military member can only sell back a maximum of 60 days of leave during his entire military career. He or she can spread those 60 days out over different periods, for example. They may sell back 10 days of leave during the first reenlistment, then 10 days during the next reenlistment, and so on. If one reenlists while in a combat zone, money received for selling leave is tax-free. Military members may opt to take terminal leave when they're discharged or retire. For example, let's say you are scheduled to be discharged on Sept. 1, and you have 30 days of leave saved up. You can out-process from the military 30 days early, then continue to receive full pay, including base pay, housing allowance, food allowance, and any special pay, until your official date of discharge. During the two weeks around the end-of-year holidays, the Army all but shuts down basic training and advanced individual training (AIT) schools. The Air Force and Navy do not shut down basic training but do shut down many of their job schools (such as tech schools and A-schools). This period is known as Christmas exodus. Recruits are usually allowed to go home on leave at this time if they want to, even if it results in a negative leave balance. Those recruits who choose not to take leave at this time are normally assigned to do details such as answer phones or cut the grass since most of the instructors, and drill sergeants will be away on leave. A pass is nonchargeable time off. During normal off-duty time, troops are considered to be on a regular pass, for which they use their military ID cards. With a few exceptions, a military person can leave the base when off-duty without special permission. Another type of pass is a special pass, such as a three-day pass. These are issued by the commander, first sergeant, or (sometimes) supervisor for time off given as a reward for superior performance. Usually, a special pass cannot be used back-to-back with leave, and cannot in most cases be used in conjunction with a weekend or other scheduled off-duty time. In the Air Force, job training is called technical school, or sometimes tech school for short. In the Navy, initial job training is called A-school (advanced job training is called "C-school"). The Army refers to their job training as AIT (advanced individual training). The rules concerning military leave don't end after boot camp graduation. For non-prior-service enlistees, there are restrictions such as curfew, restriction to base, and wearing of civilian clothes for the first portion of job training. Each branch of the military handles these slightly differently. The Marine Corps does not impose any special restrictions on their Marines during job training. However, all non-infantry Marines have to attend a special basic combat training course before they continue on to job training. The Coast Guard also does not impose restrictions during their job training, because CG personnel do not go to A-school directly out of basic training. They must spend a year or so at their first duty station, doing general duties before they get to choose a rating (job) and go to A-school. It's important to remember that, except for the Marines, leave is not usually authorized following basic training.